Originally Published in May 2015 Issue (Vol. 18 | No. 4) of Graphic Arts Magazine. 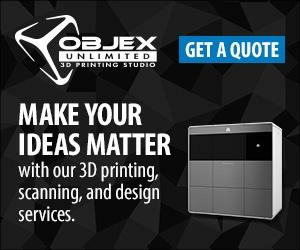 Objex Unlimited worked with closely with Graphic Arts Magazine to write articles catering to a print media and graphic arts crowd to educate about 3D Printing. This is part of that series of articles. Let’s explore how to market and target customers with your 3D products and 3D Printing services. The challenge with 3D technologies is that they’re “cutting edge.” Only a few firms so far have been true pioneers in using 3D to enhance their brand while communicating the benefits in a concise and value-added way. As a result, many of your customers won’t completely understand the advantages of your new 3D Printing Services, so you’ll need to engage them with examples specific to their needs. Engage your customers with impressive, diverse samples to show them what’s possible using today’s 3D printers and scanners. There are still many misconceptions out there in the world of 3D, so customers can’t be expected to do all the research themselves. It’s your job to show them what’s possible via samples that cater to their needs and particular industry. Don’t explain why 3D Printing can help them – show them! Make sure the materials you use in your samples are also diverse – wax, rubber, polymers, nylon, carbon fibre, metal, etc. – as well as full-colour options and a variety of plastics and resins. The amount of printable 3D materials is constantly expanding, so the more materials you can show, the more likely one of them will impress. The variety of industries using 3D technology may shock you. For example, ever heard of Invisalign? Invisalign uses 3D printers to produce clear, custom orthodontic braces. I recently learned of a detailed, 3D printed prototype of a new sports stadium done for a fraction of its traditional cost of $500,000 – and in less time. One shoe company wanted prototypes of different designs and used 3D Printing to get samples faster and cheaper. Then there was a tool manufacturer that needed 3D samples to ensure that its products fitted comfortably in the hand and that its switches were easily accessible. Get the picture? So what companies should you approach? The answer is just about any business! And never forget about consumers who will be amazed at your 3D prints and other products and novelties. I’d also investigate tradeshows (booth design), display companies (indoor/outdoor, POP), ad agencies (2D artists), industrial and commercial prototyping, packaging, marketing firms, premiums and incentives, etc. There are literally thousands of possible applications that today include aerospace, automotive, consumer products, healthcare, governments, industrial/business machines, education, research, arts, architecture, engineering and so on. While 3D printing is new and exciting, its advantages are the tried-and-true benefits that most businesses want – namely better quality, reduced material and labour costs, faster time to market, maximum flexibility in design and mass customization. Even complex 3D components are generally lighter and, depending on technology and material, stronger and more robust. And the best news of all – you can offer unprecedented cost savings to your clients while still marking up your products substantially. If you’ve purchased a 3D printer, conduct on-site demonstrations – and have an expert on hand to explain how the machine works. Alternatively, get an expert from the company you’re partnering with to perform demonstrations if you haven’t purchased the equipment yet. People feel more at ease purchasing when they understand the process.